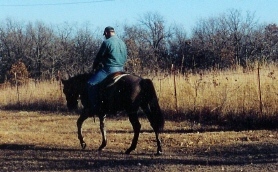 Soft feel on your part is being as light and easy as you can with your hands/ reins and releasing for the slightest try. If done right, it will one day lead to collection. This softness is something we should ask for from the very start. If the horse isn’t soft and light on the ground, he won’t be when you’re on his back. It’s important to remember that to get this softness and lightness in the horse we have to operate with feel. You might ask – What is feel? 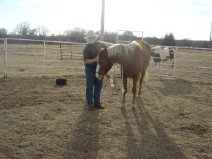 the best definition I’ve found is explained in Bill Dorrances book True Horsemanship through Feel. He explains it in a way that is understandable and that only a 90-year-old man with all that experience can. There are two types of feel – direct and indirect. Learning to use feel directly and indirectly is a lifelong process and takes lots of judgment . Feel is all the horse has to go on. When you observe horses together, there is a lot of feel going on – Things being said loud and clear that can be so slight. As an observer, we might miss this. Indirect feel is what takes place when your horse is loose. If you move a certain way and he responds. 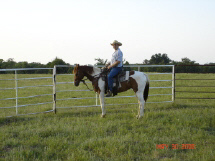 Direct feel is when there is a lead rope or reins involved. 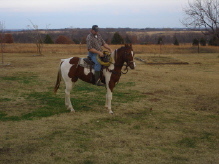 I haven’t always worked with feel, but since I begin some time ago, I have noticed a profound difference in my horses. 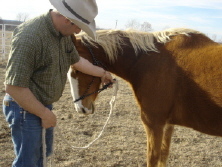 In the picture above, you can see the softness throughout the horses whole body (a real mellow look to him). I had just asked him to bend/flex his neck to the right with a soft feel, and he had responded well – so he is being rewarded. The best reward for your horse is the release of pressure and plenty of good rubbing. You can’t do too much of that. Here I’m presenting a feel to the horse (from the ground) to break at the poll. (IF YOUR HORSE WON’T DO THIS ON THE GROUND, HE SURE WON’T DO IT WHEN YOU’RE ON HIS BACK!) Notice he is lowering his head, which is nice, but not what we’re asking (we call this searching.) Horses can sort this out, and as long as the release comes in there on time, they sort it out rather quickly. IMPORTANT – notice my hands on the haler/rope – it is just my fingers. There is not force where the horse is involved – only feel. Sometimes that feel is so slight, and other times quite a lot, but force is a word/idea best forgotten when it comes to the horse. This horse is still really new at the hackamore ( Bosal and mecate –I don’t believe in the “mechanical hackamore” ) So the soft feel is different to him than with the snaffle (at which he was fine.) So we’ll just wait for him. He’ll sort it out. It would have been better and easier for the horse had I raised one hand/rein higher. Here I’ve gotten a soft feel, even though my release wasn’t quick enough. Notice the whole horses body is soft with the exception of his ear/eye. He’s wondering where the release is. The reason I wanted to discuss soft feel first in the basics is that it is important in anything you do with the horse. Whether it’s flexing him, backing him one step at a time, or teaching him to lead up free or even haltering/bridling. 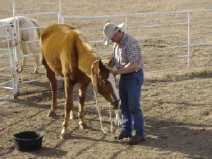 If you have any questions about how to get a soft feel with your horse please contact us.